Product #1632 | SKU 1419575 | 0.0 (no ratings yet) Thanks for your rating! The Legendary Super Wide-angle Traveler: This compact super wide-angle lens produces distortion-free images at all apertures. 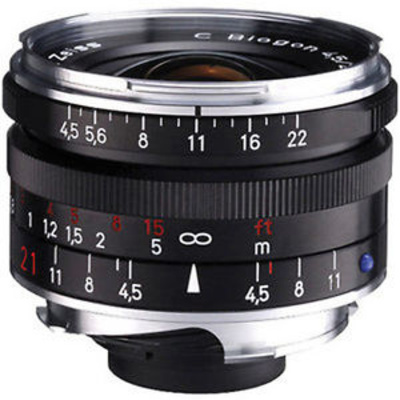 The C in the C Biogon T* 4,5/21 ZM name stands for both ‘compact’ and ‘classic’, the latter referring to a legendary Zeiss design from 1952. Smaller and lighter than the Biogon T* 2,8/21 ZM, it is ideal for traveling and for photographing unobtrusively in public places. The lens is rangefinder-coupled for easy focusing and the optional 21 mm viewfinder is available for accurate image composition. Combined with a digital rangefinder camera with a 1.3 crop factor, the lens has an effective focal length of 27 mm. The C Biogon T* 4,5/21 ZM is an ideal lens for many different wide-angle applications including travel, architecture, landscape and interior photography. Please Note:This lens is NOT recommended for use with Leica M9 rangefinder digital cameras. The angles of this lens are too steep for the sensor design and it results in a red color shift at the edge of the frame.